Offering a unique approach to numerical research methods, Analyzing Quantitative Data: An Introduction for Social Researchers presents readers with the necessary statistical applications for carrying out the key phases of conducting and evaluating a research project. The book guides readers through the steps of data analysis, from organizing raw data to utilizing descriptive statistics and tests of significance, drawing valid conclusions, and writing research reports. The author successfully provides a presentation that is accessible and hands-on rather than heavily theoretical, outlining the key quantitative processes and the use of software to successfully draw valid conclusions from gathered data. In its discussion of methods for organizing data, the book includes suggestions for coding and entry into spreadsheets or databases while also introducing commonly used descriptive statistics and clarifying their roles in data analysis. Next, inferential statistics is explored in-depth with explanations of and instructions for performing chi-square tests, t-tests, analyses of variance, correlation and regression analyses, and a number of advanced statistical procedures. Each chapter contains explanations of when to use the tests described, relevant formulas, and sample computations. The book concludes with guidance on extracting meaningful conclusions from statistical tests and writing research reports that describe procedures and analyses. Throughout the book, Statistical Resources for SPSS® sections provide fundamental instruction for using SPSS® to obtain the results presented. Where necessary, the author provides basic theoretical explanations for distributions and background information regarding formulas. Each chapter concludes with practice problems, and a related website features derivations of the book's formulas along with additional resources for performing the discussed processes. 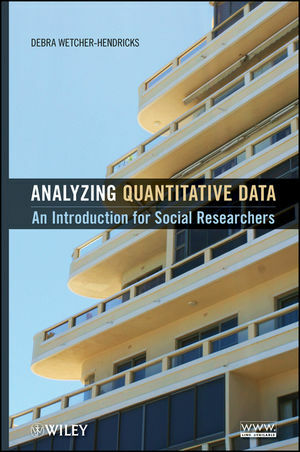 Analyzing Quantitative Data is an excellent book for social sciences courses on data analysis and research methods at the upper-undergraduate and graduate levels. It also serves as a valuable reference for applied statisticians and practitioners working in the fields of education, medicine, business and public service who analyze, interpret, and evaluate data in their daily work. DEBRA WETCHER-HENDRICKS, PhD, is Associate Professor in the Sociology Department at Moravian College. She has published several journal articles in her areas of research interest, which include quantitative data analysis, interpersonal communications, and gender relations.